Did Tucson Police Go Too Far In Putting Down Arizona Riot? Despite Tucson police praising their handling of an unruly UA crowd following Saturday night's Wildcat loss to Wisconsin in the Elite Eight, its department of internal affairs will investigate video showing one officer violently blindsiding a female student who was reportedly just trying to get out of the area. Students gathered on University Boulevard as they had after previous NCAA Tournament games, but one student who was there tells us the reaction from police in full riot gear was much different this time. "It seemed like cops were asking for trouble," the student wrote in an email. "Wearing gas masks and lining University Blvd. before the game ended (even before OT began) seems excessive." "These girls had been trying to get to their car. The girl is on her phone not paying attention and this cop came out of nowhere and just leveled her," said Phoebe Landolt. "After that everyone just started yelling and she started crying." A Tucson police spokesperson said internal affairs has been given a copy of the video, and will investigate that—as well as "body cameras" worn by officers—to determine if excessive force was used. "We've been hearing all the complaints that we were excessive," that spokesperson said. "Which you'll be able to see, I think, from what we have, that we gave these dispersal orders over and over and over." According to a police statement, the crowd was declared an "unlawful assembly" and given an order to disperse. That's when things first became physical, with some fans throwing beer bottles, cans, and firecrackers at officers. 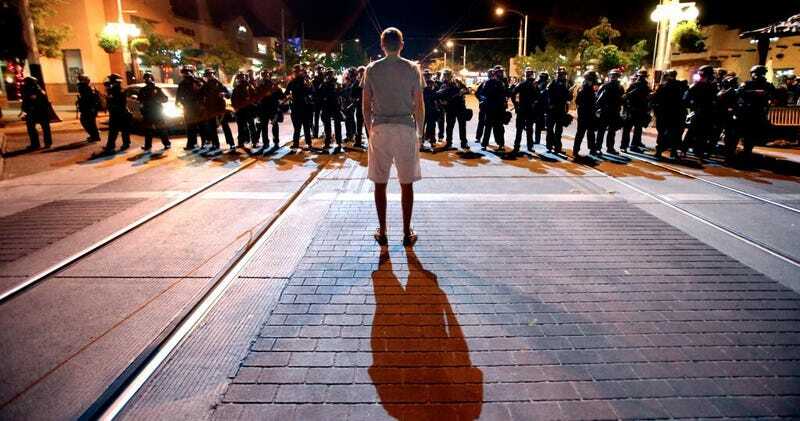 Tucson police then began using nonlethal force to break up the crowd. That, according to police, included two Arwen Rounds (hard rubber projectiles), four foam baton rounds, nine OC vapor aerosol canisters (containing a capsaicinoids, like pepper spray), and 200 pepper ball rounds. Like those that splattered ineffectually upon the riot's folk hero, "Arizona Bro," aka Alexander Davidson. Davidson was one of the 15 people arrested. Jonathan Graham, the owner of a bar on University Boulevard, praised the police for their actions and said he believed they were actually very patient with the crowds. But Graham also noted that the students didn't cause any trouble or property damage, and there was no violence until police began trying to clear the streets. "And the kids, I want to say they weren't unruly, it was drunk college kids partying after a loss. I think more were hanging out in the street rather than trying to cause problems." The Tucson police's internal review of the situation is expected to take weeks or months to complete, but the Arizona student who emailed us claims she knows some of those injured on Saturday night, and says they are preliminarily planning to file lawsuits against police.